EXPOSED with John E. Marriott, Episode 2: Grizzly Bears of the Khutzeymateen is now live! Episode 2 is now online at www.exposedwithjohnemarriott.com! Join John for a week-long adventure into the heart of Canada's first and only grizzly bear sanctuary, the magical Khutzeymateen. 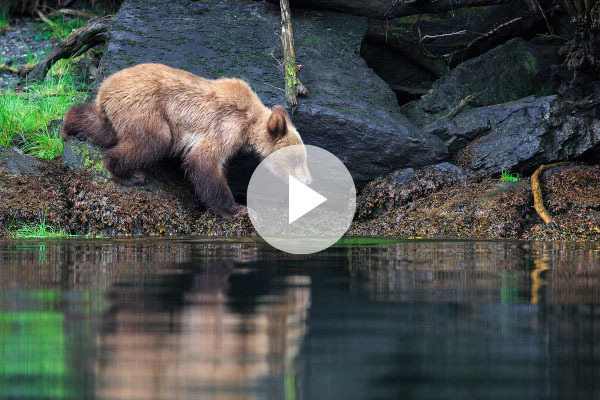 You'll discover first-hand what it's like to be along on one of John's photo trips in the Great Bear Rainforest and you'll meet the Lady of Larch, Koda and the legendary Frank the Tank along the way. Enjoy! And thank you everyone for the incredible support for Episode 1: Stop the BC Grizzly Trophy Hunt, we've had almost 50,000 people watch it already. You can view all of the episodes, including the Meet John E. Marriott introduction, online on the website, www.exposedwithjohnemarriott.com or on our new YouTube channel, EXPOSED with John E. Marriott. You can also follow along with our new Facebook page dedicated to the show. Stay tuned in three weeks time for our third episode, a hard-hitting affair in which John pulls no punches in uncovering the dirty secrets behind the Alberta wolf cull.